Wow! I never even heard of Côte d'Ivoire, but guessed it to be on the African continent. I won't bore you with answers, though I would like to visit Greece. (I'm not holding my breath) Be well! You're way ahead of me but my map would look a bit better after next month when we visit Canada. Travel is such fun, i'd love to see Canada, Australia, and New Zealand. Hubby and I used to like to travel, but at our ages we've decided to stay closer to home. Short trips that don't make you travel all day long or longer. We've done that. Kauai Hawaii was or favorite place to visit. I've been to Hawaii once. Would love to go back one day. I want to visit Alaska. 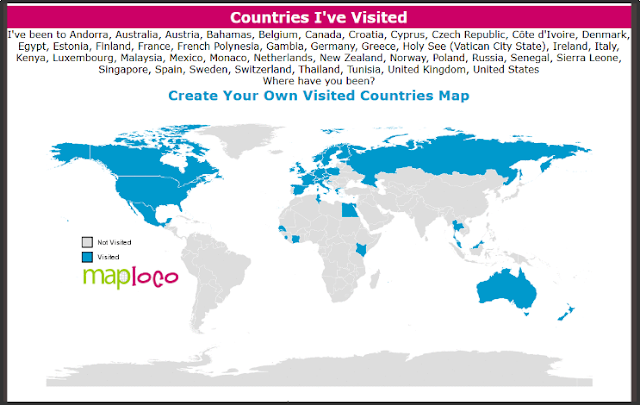 The only countries on your map I've been to are US, Canada, & Mexico. Pretty limited, huh? I'm with you on Alaska - I'd love to visit there one day. I’ve been to 49 of the fifty US states. The plan is to sail to Hawaii in 2019 to make an even fifty. Spain is missing from my map! Oh well. Awesome that you're going to sale to Hawaii! What a great way to tick that fiftieth off of the list. Your trip to Croatia sounds wonderful! Wow! You get around-round-round-round, you get around! It's awesome that you've seen so much of the world. There are a kazillion places I'd love to see, but my hubby isn't all that keen on ever getting on an airplane again, so it isn't likely we'll be seeing much more of the world than we've already seen, which is fine. My favorite place we visited was Hawaii. We've been so lucky to travel as much as we have.